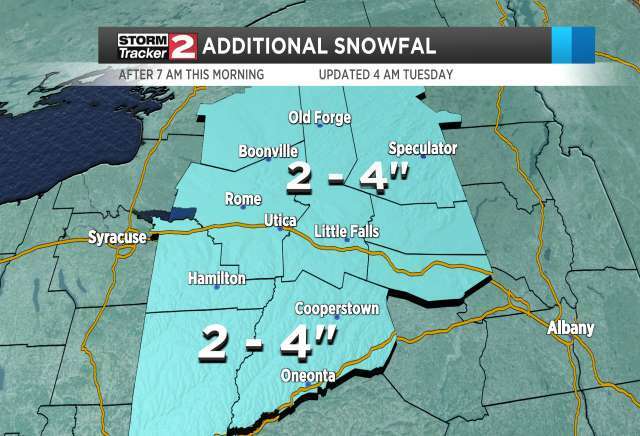 Snow will continue to fly in Central New York for the majority of the work week. We're in the middle of a long duration snow event in Upstate New York. The storm that's driving the snow in the local area is a nor'easter to our east. Really heavy snow is bringing feet of snow to Southeastern New England Tuesday along with strong winds and whiteout conditions. Blizzard warnings are in effect along the coast. Additional snow is expected Wednesday night and Thursday before this weather system comes to an end. Colder weather will follow as we head into the weekend.